Liquid Pool Covers - May is National Water Safety Month! The first of May marks the beginning of water safety month! If ever there was a a great way to celebrate swimming AND dedicate a month to the importance of safe swimming, national water safety month is it. Just about ever person living in North America has been touched by swimming in some way, shape or form, and it is incredibly important that we all know how to be safe in the water. Wherever your favorite place to swim may be - a backyard pool, your neighborhood public pool, the ocean, lakes or rivers, safety must be a priority. There are many people out there who believe they and their families are safe in the water because they know how to swim. "Swim" is a relative term and is applied to all levels - from the ability to keep your head above water, to being as fast as Michael Phelps to having as much stamina as Ryan Cochrane. There is more to water safety that being able to swim. It also means knowing the rules of the pool, knowing your limits, and knowing how to safe in the presence of other swimmers. For pool operators, it means having safe equipment and practices. Pool safety can even extend to water chemistry. Using eco-friendly and safe products in your pool is just another way of ensuring a safe swimming environment. Heatsavr, for example, is a 100% safe and eco-friendly product that keeps your pool covered in order to conserve water and energy. 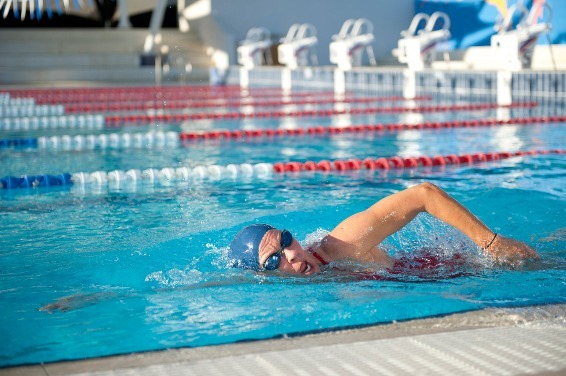 Heatsavr is used in a variety of environments, including therapy, hospital and school pools, and over 20 years of testing has proven it to be safe and reliable for all safety conscious swimmers. Another part of water safety includes safety measures around swimming pools - such as fences, alarms and safety covers. It is important to realize that while a liquid pool cover will not keep swimmers out of the pool like a specially made safety blanket, it will eliminate the risks associated with getting caught unaware underneath a plastic pool blanket. On behalf of Flexible Solutions, happy and safe swimming to all!